We are offering cotton shirt with the following features: It is made from 100% cotton. It is available for men and women.It is perfect formal shirt. It is easy to wash and comfortable to wear. These shirts are made using premium quality fabrics to ensure durability, easy maintenance, colorfastness and optimum comfort. A sophisticated style. Cutaway collar shirt with side pleats on the back. Single patch pocket with contemporary detail. Straight barrel cuff.Back yoke with inverted pleat. Rounded hem. Centre back length for size 38: 75 cm. Composition: 100% Premium Giza Cotton. Slim Fit. Confident stripes, in an array of bright colours, on 100% cotton twill weave fabric. Biased detailing on collars and cuffs make a perfect style statement. 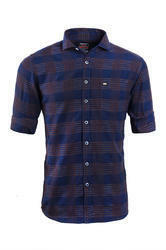 We are one of the accredited manufacturers and suppliers of a premium range of Cotton Strip Shirts. 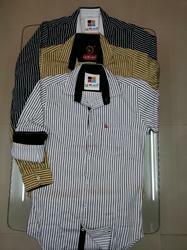 These shirts are developed using finest and soft fabric that is sourced from reliable vendors of the market. Owing to availability in varied colors, sizes, designs and patterns, our range is highly applauded by the clients. We are offering Stripped men shirt of Zerox brand which are available with us in varied sizes, patterns and colors. Clients can avail these garments from us in v-neck, round neck, bottle neck as well as in full and half sleeves. Our range is widely appreciated for its design and is worn in formal and casual wear. We also customize these shirts according to our clients.